Locally owned and operated, we are a Victoria, British Columbia based firewood delivery company who specializes local, domestic and international firewood sales and distribution. Established in 2010, we take pride in personalized service and ensuring our customers receive the best quality seasoned firewood for all applications including fireplaces, furnaces, wood stoves and even ovens. All of our firewood is seasoned, stacked, delivered on pallets and ready to burn! Maintaining a perfect moisture content of 16%-20% can be difficult at times on the coast of rainy British Columbia, but we guarantee your wood arrives dry, seasoned and ready to burn. When your delivery arrives, feel free to ask our staff to show you a moisture content measurement. Excuses are not acceptable and accuracy is the name of the game. All of our trucks have moisture content reader on-board and we look forward to showing you why our wood is the best. Please feel free to ask our staff for a moisture content reading. We don’t deliver ok, average or good firewood. We deliver the best firewood you have ever ordered. Firewood perfection. Our loads are pre-stacked in pallets so you can see exactly what you are getting. When you order a cord from us, it arrives in two 4ft cube pallets that you can easily see. We love our job. 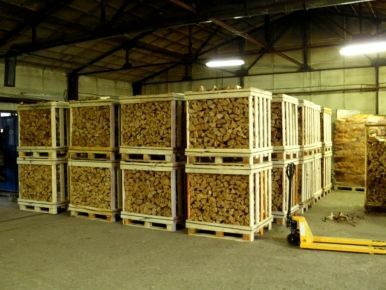 Nothing makes us happier than seeing the eyes of our customer light up when the witness the massive volume of our tightly packed pallets of perfect firewood. How long does it usually take you to put your wood away after it is delivered? 1 hour? 2 hours? 4 hours? With our palletized wood, we can manoeuvre your order straight into your garage or shed. Storing wood outdoors? Try our pre-wrapped pallets of firewood that come with a quality tarp that is covering your order when it arrives. The biggest difference is our passion. We are passionate about firewood. We are passionate about people and truly enjoy witnessing customer satisfaction. Firewood is an essential heating resource on the Island and we understand the importance of offering a reliable service 365 days a year. Avoid getting burned by fly-by-night wood dealers who sell illegal or stolen firewood. How much are the pallets? Customer who wish to keep our pallets for storage purposes can borrow them in exchange for a $25 deposit per pallet.